A 15-year-old schoolboy has been charged in connection with a quadruple stabbing in south London that left one boy fighting for his life. The boy – who has also been charged with a drugs offence – is one of six teenagers arrested over the shocking violence, that saw four boys aged 15 and 16 being stabbed. 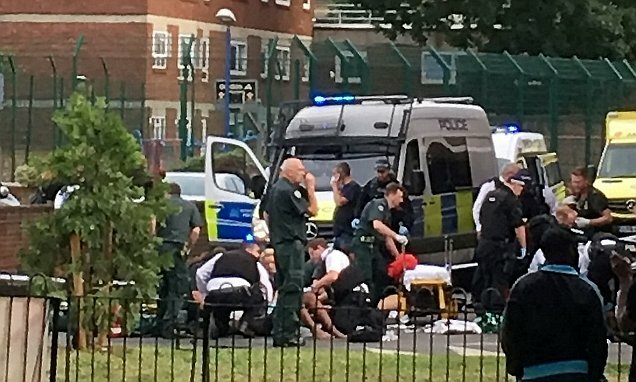 Witnesses described seeing one of the children left with his intestines hanging out after the stabbing on a housing estate in Camberwell after a group of 30 teenagers started fighting. He has now been taken off the ‘critical’ list but remains in a ‘serious but stable’ condition in hospital. One other boy remains in hospital and is said to be stable, while the remaining two victims have been discharged after treatment. All four were stabbed in broad daylight during a mass brawl on the Elmington Estate on Thursday afternoon. Detective Inspector Luke Williams, of Southwark Police, said: ‘A youth has been charged in connection with an incident in which four males sustained stab wounds following an altercation in Camberwell. ‘The 15-year-old was charged with possession of a bladed article and possession of cannabis and has been bailed to appear at Camberwell Youth Court on September 5. DI Williams, who said the investigation was ongoing, added: ‘This incident saw another act of serious violence on our streets and is unacceptable. ‘I appeal to anybody who saw what happened or has any information about the events which took place in Camberwell on Thursday to contact us; we need the support of the local community in order to bring those responsible to justice.